In the small village of Longshangzhai, the handmade paper-making process is a treasured inheritance, passed down through generations. At The Grain of Paper, local tree bark fibers from Yunnan are utilized in a process of intricate steps that combines traditional techniques and customs with modern industrial arts. By channeling the entrepreneurial energy of the young villagers and the wisdom of their ancestors The Grain of Paper are protecting their art form whilst boosting the local economy. Slow Lane’s exhibit is a curated collection of antiques, herbal dyed fabrics, yak-wool garments and exquisite ceramics. All of their products are handmade and most were produced in their own workshops. Slow Lane are committed to the preservation of China’s artisan workmanship - from the hand-stitching on antique-fabric bags to the painstaking creation of ceramic tea sets. 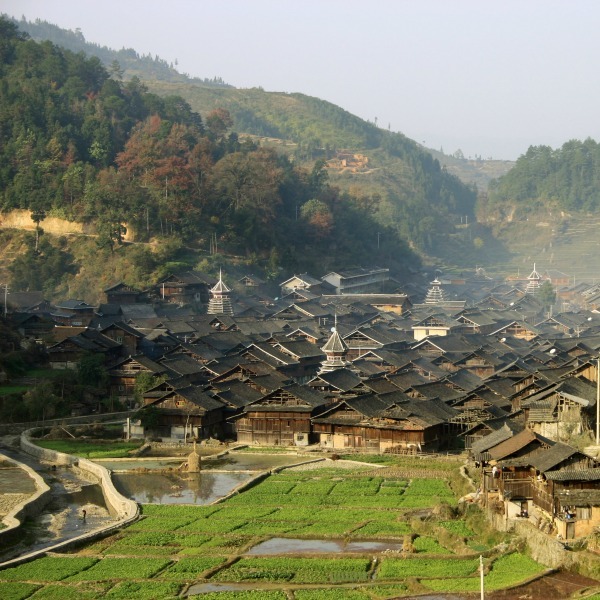 Xiyu, which sounds like the word “life” in the Naxi minority language was established in Yunnan. The founders believe that all objects originate from a need in daily life and as they develop, become collectible works of art. Xiyu collects and displays many daily objects as art and are particularly passionate about handmade copper tea sets - a reflection of their Chinese ancestor’s wisdom and devotion to tea. Following the rules in The Sutra of Measurements for Buddhist Statues, Karma Samdrup’s Thangka tell stories found in Buddhist scriptures and legends. His artistic style was inherited from Gama Gachi and he has added creative elements and personal thoughts in details. Through his portrayal of Buddhist philosophy in paintings, he hopes to help others find inner balance and cultivate wisdom through meditation and observation. Zhang was born in a small, mountainous village in Shaanxi province. He has suffered with a brittle bone since his childhood and when his daughter was diagnosed with the same syndrome, he became determined to provide her with the best medical care available. Zhang moved to Beijing and began making traditional Chinese paper cuts as a way to raise funds for her expensive treatment. Due to limitations caused by his illness, Zhang has invented a completely unique style of cutting, his images often depicting animals and mythical figures. Preserve Art was established in 2013 to discover craftsmen, investigate traditional art forms, and make artisanal crafts an integral part of modern life. All of Preserve Art’s products balance functionality and beauty to preserve traditions through innovation. Crafts they will bring to Beshan Gai include hand painted Tea Sets & Utensils from Yaozhou Pit, handcrafted Xia textiles and traditional bamboo art. Although the ceremony involved in Incense lore may be lesser known than that of tea it is just as much an art, with many varying applications. Particular incense ware and tools are used for worship, some ceremonies welcome the beginning of a new day and others performed in line with traditional Chinese medicine. Yingxiangtang offer an introduction to this lesser known custom, highlighting the artistic nature and cultural importance of the ceremony in order to encourage appreciation and preservation. The mission of The Brickyard Retreat, Beijing is to support economic development in the small village of Mutianyu. Preservation of the culture in their village is paramount; Green practices such as composting, recycling and waste reduction are adopted to ensure long term stability and local spring water is filtered to avoid the use of plastic bottles. All of their products, from walking guides to grass slippers, are sourced and made locally. Roundabout is a free social enterprise headed by volunteers. They connect those who wish to offer support to people in need. Roundabout helps channel charitable donations and volunteer efforts to worthy causes across China. They offer assistance directly passing on donated items to one of the 48 charities in Beijing (and many more throughout China) that are registered with Roundabout. paper completely by accident. From the moment her brush touched the surface, her artistic style changed and today all of her art is created on notebooks, fans, and posters made of traditional papers. Cici draws inspiration from her religion and strives to give traditional arts and crafts new meaning through her connection with Western design. Cui Rui has been collecting simple yet elegant pieces of ceramic since she was a child. She has a passion for items that are beautiful yet serve a functional purpose and Phoenix Designs’ carefully curated collection is the perfect showcase of her philosophy. Cui Rui regularly visits workshops in Jingdezhen, China’s porcelain capital, where she not only designs ceramic and porcelain with a master but works with a number of local potters who create their own innovative crafts. As the sun goes down in the far reaches of Yunnan Province, shadow puppets come alive. The designs are distinctive; bold and striking, intricately cut and painted in vibrant colors. The art of puppeteering is in the veins of Mr. Zhou. He began learning his cultural heritage from his father at a young age and is not only skilled at designing and cutting the puppets but is also a talented performer. He tells revolutionary tales and stories of legends to the tired farmers and excited children who gather to watch and listen. The art of crafting the Longling paper umbrella is steeped in over 300 years of history. It involves 72 processes, passed down over nine generations – a delicate skill preserved by very few today. Bamboo is carefully cut and shaped to create the frame, then covered with traditionally made paper and painted by hand before being coated in tung oil, a drying oil made from the seed of the tung tree. The raw materials are simple but each artist has their own style, from the stitching they use to secure the paper to the intricate detail and colors used in decoration. Widowed with a young son, Tibetan farmer Zanta arrived in Beijing at the turn of the century to support her child as a street vendor peddling jewelry. With no formal education and speaking no Mandarin, at the time she didn’t dare enter a restaurant. Nowadays, Zanta can't stop innovating distinctive designs which blend age-old Tibetan spiritualism and Buddhist symbols to create unique jewelry for the contemporary era. In the coastal province of Zhejiang, WAWAYA founder, Ping scours the countryside and the waterways of her city in search of inspiration. She finds it in the form of a precious stone, a pearl or a small piece of copper and her imagination gets to work. Without soldering, molding, using other common techniques in jewelry-making, Ping works without restrictive designs to create a piece of art that fits harmoniously with the treasure she found. The final product is contemporary and stylish, each piece unusual and unique. Established in 2006, Yucomi specializes in the design and production of bags using gambiered Guangdong gauze. Also known as ‘Soft Gold’, Gamiered Guangdong gauze has over 1000 years of history in China and was a fabric that only the rich could afford. Today, the soft, water resistant material is an innovative and eco-friendly alternative to leather. the personality and specific requirements of the individual. Passionate about exploring a clash of eastern and western styles, Cinq Fevrier incorporates fashions inspired by Beijing and Paris. They strive to achieve distinctive detail, simple structure, and perfected techniques throughout their range of products using natural and elegant material. Jianghong Li began her journey designing fashion in China in 2004 when the French government invited her to launch a classic wool sweater range, un air de China. She continues to take part in every step of the Cinq Fevrier design process, from selecting materials to dying the fabrics. For Starry, freedom and travel gives her inspiration for design. When she saw the beautiful sunset in Angkor, it was not the pictures she took that stayed in her mind but the feeling and atmosphere that she embraced and used as inspiration for jewelry. Starry’s love of nature has led her to innovatively design items that include crystal, leather, wood, and glass in their natural form. For her, each piece of jewelry is more than an item for sale; it is the embodiment of an emotion. Growing up in Hulunbuir, the founder of Marking grew up with a love for ethnic and handmade products. She combines traditional art with contemporary elements to create pieces that everyone can enjoy. Miamai was established in 2009 to give customers better options for bags in a city where women need a bag suitable for all occasions. Striving to combine beauty, functionality, and style Miamai create bags that are not only beautiful and unique, but also functional. Tiantian Chen established The South in August in 2015. With no background in design, she draws inspirations from her feelings towards life and objects to create handcrafted pieces of art. Fascinated by the diversity and vitality of plants, her jewelry on display at Beshan Gai uses nature as an inspiration. Jasmine is an independent designer from Beijing. She established Fengtong Jewelry in 2007 with a vision to find every woman the perfect piece of jewelry to fit their personality. Every piece she creates is made of pure silver, carat gold, or natural stones, and features Chinese elements. Through innovation and development, Fengtong Jewelry has maintained the originality and diversity of its range which has helped them establish themselves in the jewelry industry in China. At Shancunfengwu wines in Fujian, ancient customs arefollowed to make traditional Hakka Rice Wine - a local delicacy. They select high quality, organic ingredients and source water from a natural stream. All of the traditional processes are completed by hand and some of the wines have been fermenting for years; the producers blow the dust off the top of the bottle before it is consumed. Established in 2013, Chai Mi Duo produce high quality, organic food with a goal to encourage a healthier lifestyle for the people in their area. At their original location, close to the shores of Erhai Lake, Chai Mi Duo cultivates vegetables and cereals that are planted and picked by hand. In their larger farm on Cangshan Mountain they raise animals including ducks, cows, chickens, pigs and sheep. Bushao are dedicated to creating innovative snacks that are delicious, nutritious and contain locally sourced ingredients. Bushao believe that snacks should not be junk food but an integral supplement to regular meals that bring happiness to the taste buds of children and adults alike. Creekside Tea Lounge stock high-quality teas from all over China, including Pu-erh from Yunnan and, traditional Wuyi cha. They also specialize in the collection of ancient ceramic tea sets from Jingde, Taiwan, and Japan. Inspired by Chinese traditional lifestyle, Creekside Tea Lounge hope to share a taste of the real flavors of tea with the public in Beijing and restore tea drinking as a way of life. BAO HOUSE, the very first food truck in Beijing , is located at the north entrance of The Opposite House hotel. 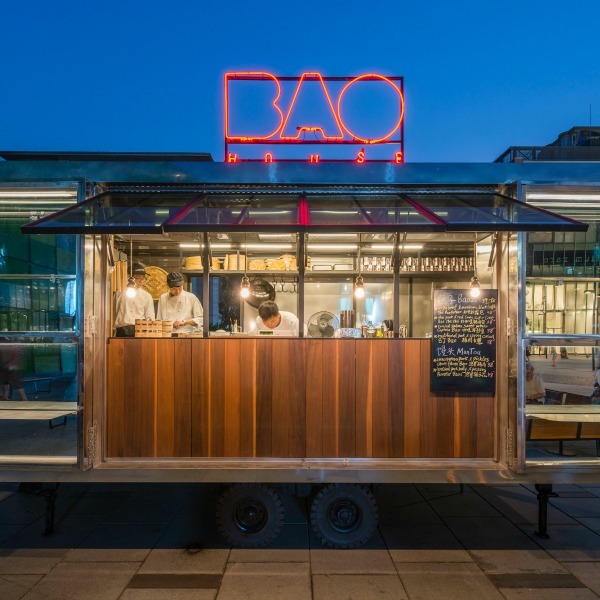 This playful baozi food truck is fully operated by the hotel team and has taken a modern, international approach on bao’s and mantou’s combined with a traditional culinary steaming method. This one-of-a-kind restaurant with a menu celebrating Chinese hot pot offers the freshest meats, seafood, and vegetables cooked at the table along with a vast assortment of draft beers, wine and sake. Inspired by authentic Chinese cuisine along with other Asian flavors, RED BOWL features a large bar counter with an individual hot pot for each guest or guests can gather around a delicious simmering metal pot at the center of each table. Tao Guo’s family has been producing artisanal honey for three generations. They spend their lives keeping bees and harvesting honey, an ancient trade kept on by very few in his village. Agricultural techniques are passed down from father to son and for Tao Guo, the secret to creating delicious, high quality honey is not written in books – it is in the minds of these laboring in the field. Throughout its long and storied history, tea has transcended its humble origins as a simple leaf to encapsulate and symbolize the essence of Chinese culture and tradition. Rushi Shifang, from Beijing’s Jiahao Tiancheng Trading Company, epitomizes this illustrious past with its range of authentic, traditionally crafted teas. They produce teas that are steeped in the aura of China’s tea-growing history whilst elevating their products to appeal to a modern tea drinking generation. A spacious and naturally lit setting, offering casual dining throughout the day with a contemporary interpretation of international favourites. Jing Yaa Tang is a Swire Hotels’ collaboration with London based and internationally recognized restaurateur Alan Yau as lead designer and concept consultant. Jing Yaa Tang introduces a selection of Beijing roast duck dishes, simply prepared and expertly executed. The menu extends to Chinese regional favourites such as authentic Kung Pao Chicken and Dandan Noodle recipes. Established in 2000, WildChina is a luxury travel company specializing in authentic experiential travel. They offer bespoke journeys and expert-led small group tours that cater to the curious traveler and facilitate in-depth exploration of people and places. WildChina’s innovative style has been critically recognized through numerous awards. At BeshanGāi, WildChina’s experienced trip designers will be offering free, English language travel consultations. In 2011, WildChina launched their outbound brand, Beshan Travel, bringing their award-winning travel style to Chinese. Trend-setters for experiential travel in the Chinese market, Beshan have been featured by China’s biggest travel and lifestyle magazines including Conde Nast, Harpers Bazaar, and Vogue. They have also been named one of China’s top 12 luxury travel companies in 2015 by Hurun Report. At Beshan Gāi, Beshan trip designers will be offering a free, Chinese language travel consultation service for all visitors. Penguin published Travels Through Dali: with a leg of ham, is WildChina founder & CEO Zhang Mei’s first book. Personally narrated by Mei, a Dali native, it as much a personal journey as it is a cultural one. It features over 150 gorgeous color photographs, personal stories, and rare authentic home recipes that bring to life the history, heritage, and changing landscape of Dali. Newugo is the Airbnb of experiential travel. The online platform connects travelers looking for authentic experiences with local people passionate about sharing their skills. Visitors to the site can currently choose from over 400 experiences, in 14 provinces in China. At Beshan Gāi, Newugo will be showcasing a selection of their platform’s artisans. Look out for ancient tie dying with plants from Dali, Pottery that has been formulated and baked with techniques passed down for thousands of years and experience the charm of Jing embroidery, an ancient Chinese embroidering technique from Beijing. WildChina Education believes that travel and learning go hand in hand. They work directly with institutions that feel the same to custom design and deliver innovative experiential travel programs. This year, WildChina Education is excited to launch the WildChina Junior Explorer Grant, an opportunity for young people between the ages of 15-18 to put their creativity to the test in a real world setting. Join the team at Beshan Gāi and explore China’s distinctive architecture. Since starting out in 1968 as a tiny free London magazine, the Time Out brand is now a trusted global platform that inspires and enables people to experience the best of their city, wherever they might be. Like all the magazines in the group, Time Out Beijing is the foremost authority on where to eat, drink, shop and play – perfect for both longterm residents and visitors. The traditional Chinese art of Sugar Painting originated in the Ming Dynasty when figures were made as part of offerings at religious ceremonies. The form was developed and became widely popular across China. It is preserved today by artists who create highly complex, edible works of art using liquid sugar and simple, traditional tools. Hemu is attending Beshan Gāi as recipients of the WildChina Education Artisan Scholarship. Two ten-year-old girls, Muer and Hehe named their brand Hemu, which resembles the word peace in Chinese. The girls have put together a team of peers who teach skills such as origami,and Tie-dying. Through their efforts, the girls hope to raise money to help left-behind children in Guizhou. Beijing-based children’s clothing brand Tang’ Roulou was founded in 2007, a poetic answer to French designers Amélie and Pierre-Yves’ perception of Chinese culture. As yin and yang, they draw inspiration from their daily lives in China’s capital and offer colored, poetic and bucolic creations, with Asian imaginary dancing joyfully in a setting of dots, stripes and flowers. join the #beshangai buzz to win prizes! Keep an eye out for the announcement of Beshan Gai month when we will have some amazing prizes to give away!